Although it's not more efficient than buying right in-store, pickup is a retail trend on the rise. A big reason why? It benefits both companies and consumers. For consumers, in-store pickup combines the ease of shopping online with the promptness of purchasing from a local retailer. But while it's been revealed that this method isn't any more efficient than just buying in-store, that hasn't stopped brick-and-mortar shops from adopting and promoting this service — nor has it dissuaded customers from using it. According to a recent survey conducted by Boston Retail Partners company, 78% of retailers plan to implement in-store pickup service within the next three years; currently, 41% already do. So what's the deal? Why is this trend growing? Say you order an item online for pickup. You head to the store to retrieve it, but while you're there, you can't help but fancy a few other items available on sale. Soon, you're walking through the automatic doors with bags that are slightly heavier than you had intended. For retailers, in-store pickup is a means of attracting customers to a physical location and, while there, influencing them to add to their initial order. It's worked for Kohl's, which recently introduced in-store pickup to all 1,164 of its locations. Per a study from StellaService, 20% of Kohl's in-store pickup customers make another purchase. 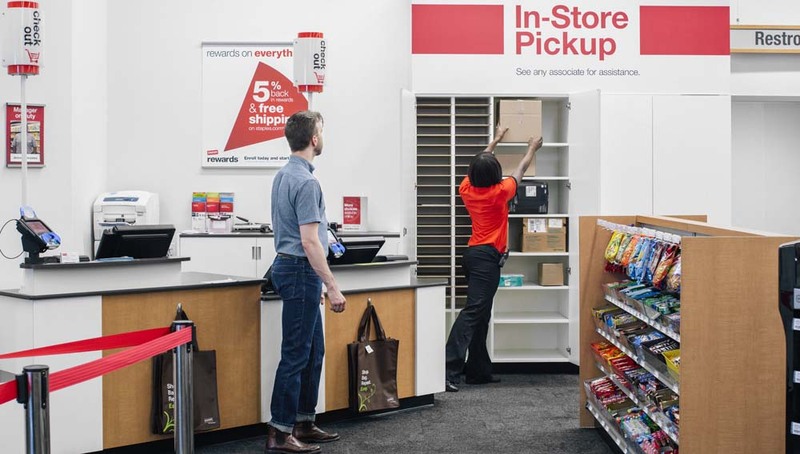 Office supply chain Staples is also benefiting from the rewards of its in-store pickup program: "We do see a significant percent of our customers buying additional items from the store when they go to pick up their online purchases," says Danielle Lachman, Staples' Vice President of eCommerce Strategy & Business Development. "People are becoming more accustomed to purchasing online, and this additional buying option takes out a lot of the pain points for consumers that are associated with shopping online," says Ani Collum, Partner and Retail Consultant at Retail Concepts. Those "pain points" for consumers, according to Collum, include shelling out extra for shipping costs and fretting over whether they'll be available to collect their packages. Shopping at a retailer that offers more than one option for delivery can be reassuring for customers who like flexibility. Depending on the situation, it can make a retailer more amenable to a shopper's current needs. Unless you're willing to pay a premium for expedited shipping, or you're purchasing from a store that boasts same-day shipping at a reasonable rate, you're not going to receive your online order immediately. If you're pressed for time and need an item ASAP without breaking the bank on rush delivery, buying from a store that features free pickup is extremely appealing. In fact, it's rare that a store charges for pickup; JCPenney charges $3.95 for orders under $25. Yes, it's not much quicker than just buying in-store, but pickup still has its benefits. It combines the conveniences of online shopping — browsing and price-comparing at your leisure — with the instant gratification of having an item in possession almost immediately. Shoppers do not have to sacrifice the opportunity to purchase an item at the best price available, as they'll have the chance to price check against other merchants and take advantage of online-only promotions. Plus, as we mentioned, in-store pickup can be a money saver in and of itself if a desired item isn't eligible for free shipping. In-store pickup is especially useful for reserving products that have a high risk of selling out: "[Customers] are able to guarantee that they get the item and not have to leave it to chance while shopping in the store," says Collum. Retailers benefit from in-store pickup because it brings foot traffic to their brick-and-mortar locations, increases sales, and appeals to consumers who like freedom of choice. As a result of all this, it's no surprise that retail insiders anticipate the pickup option to become more prevalent. For many established merchants, it has already become an online shopping staple; Walmart, Sears, and Home Depot, for example, have long offered in-store pickup. But even less obvious stores have begun adding it, like Macy's and small boutiques like the Lily Pulitzer store In the Pink. And even the quintessential e-commerce king, eBay, now offers it — or rather, the big box stores like Best Buy, Target, and Toys"R"Us that utilize the popular marketplace as an alternate storefront do. If the data is to be believed, we can expect in-store pickup to become a significant presence in even more stores in the future. "We've seen more and more retailers offer in-store pickup as a delivery option over the last year," says Emily Kolodner, Senior Research Associate at StellaService. "As this practice becomes more popular, retailers are charged with aligning processes and standards across all channels to ensure shoppers receive the same level of service regardless of when, where, or how they choose to shop." Readers, have you noticed an increased presence of in-store pickup at your favorite stores? Do you take advantage of the service yourself? Share your thoughts in the comments. Ordered something online to pick up at store. So a lady went to the back to get it. I'm like it should be ready at the waiting area when they told me its ready for me to pick it up. Waited for 15 mins nothing! So I went around the counter and being a busy body and lo and behold I found a box with my name on it where they put the stuff on the shelves in the waiting area. I'm like excuse me. My stuff has been right here waiting for me . And I recall none of u even bother to look at the shelves. Only works for me if it is a pick up area dedicated to order pick ups. At my local Best Buy, you have to wait in the Customer Service line with the folks returning things. This sometimes equates to a much longer wait then is acceptable for just picking up an order that is already paid for! I have registered this as a complaint at the store. Yay you, indeed. That's certainly a take I didn't consider and appreciate your sharing it. Thanks for the tip! I have used Best Buy and Advance Auto for in store pickup. Both have had my order ready when I arrive at the store. There's an Advance Auto near my home, and it is my 'go-to' parts store for my car. WalMart, on the other hand, I have used twice. Walk to the back of the store, wait for someone to show up, have them tell me they can't find the order. Issue refund, buy on amazon. I've only used Best Buys in-store pick-up and it has been a great experience so far. It's always right up at the front of the store in a cage behind customer service. Never have to wait longer than 15 min or so depending on how busy they are. "...wasn't available in-store at Walmart", I meant to say. I find in-store pickup the opposite of convenient. A few months ago I ordered a shower head from Lowe's and had it shipped to a local store. The item was not available in-store locally. It took a whopping 25 minutes from walking into the store to paying for it at the register, and I did not have to wait in line at Customer Service. They needed to make a call to the back office and someone had to look for it and bring it to the front of the store. I could not believe how long it took. When I ordered an article from Walmart that wasn't available online, I had to walk all the way to the back of the store to pick it up. Just as inconvenient as getting milk. To me, in-store pickup is much more of a hassle, and not worth the measly savings of a few dollars on shipping. Some credit cards offer significant extra cash back for online ordering, and if shipping isn't free I favor store pickup, especially if I can pick up at a store location outside the county where I live, which has a higher sales tax rate than most of the state. I use a bit more fuel, but with some planning I can run other errands in the same vicinity and usually the savings are far more than the cost of an extra gallon of gas. I read the entire article (yay, me) and was surprised to see no mention of the main reason I use in-store pickup. For example: the Home Depot here in So. Cal. has none of those 40-watt-equivalent green led bulbs that I want for Christmas lights, that were advertised at such a killer price, but there are a ton of them in Idaho. So I order online for free store pickup in So. Cal., and the stores in Idaho get rid of some of the glut that they have up there, thus alleviating the merchandising blunder that caused this mismatch of demand vs. geography. Good for me - I wouldn't have been able to walk into a local store and get what I wanted. And good for Home Depot - they sold something that they couldn't have sold in the stores where the stuff was sitting. That's the real beauty of this setup. The article simply assumes that everything you're shopping for online is already at the store that you are visiting, but that's not always the case. The reason that I shop online is so that I do not have to go to the store. My experience with in store pickup has been unsatisfying (e.g., Lowes, Sears). I would prefer that Dealnews keep a separate page for in store deals so that I do not have to screen these out when I visit the site. While picking up an item that has been shipped to the store is no doubt different, my experiences with same day pickup have been less satisfying. It seems that instead of the item being kept at the pickup counter (even if prepaid), someone is sent to fetch it off the shelf after I arrive. In such instances, the entire process often takes longer than simply getting it off the shelf myself and checking out.